Blyth Spartans suffered a desperately disappointing result on Tuesday night, losing 4-3 to Workington in the Evo-Stik play-off semi-final. Despite finishing second in the league with a string of club season records under their belt the Spartans ultimately failed to secure promotion. Workington started brightly with Arnison firing over after six minutes. Spartans responded when Daniel Maguire had a good shot blocked and a dangerous Jordan Watson cross caused consternation in the visitors’ defence. The wily Connor Tinnion then hit the Blyth bar with keeper Adam McHugh beaten. The opposition keeper, Alex Mitchell was tested by a long range Sean Reid effort which he did well to palm away before, at the other end, Blyth’s Nathan Buddle was on hand to clear a Joseph McGee shot which was heading into the bottom corner of McHugh’s net. Reid headed over the bar for Blyth before Workington took the lead after 34 minutes. Blyth failed to clear their lines and the ball fell to Scott Allison who calmly slotted the ball past McHugh. Just before the break Allison should have scored another but blazed over the bar from six yards out. However in added time the Spartans drew level when, following a corner, Sean Reid swivelled and shot low in to the goal from close range. Blyth came out rejuvenated following the interval. Maguire found Richardson who neatly side-stepped a defender but his shot was well blocked by Joshua Calvert. Despite their intent Blyth went behind again after 55 minutes when McGee picked out Allison with a neat ball, the striker then controlled the ball brilliantly before confidently shooting past McHugh. The ever-dangerous Allison scored his third after 67 minutes showing excellent movement to create space before firing low in to the goal. Despite being 3-1 down Blyth were not prepared to lie down. On 73 minutes Neal Hooks headed back across the Workington penalty area and defender Dillon Morse was on hand, six yards out, to head high past Mitchell. Spartans dramatically got back on level terms on 84 minutes when Wilson Kneeshaw’s cross was met by Maguire who drilled the ball home at the near post. Blyth were dealt the killer blow in the final minute. McHugh saved expertly from Tinnion but Robert Wilson then found himself four yards out and with time to slide the ball in to the Blyth goal. In added time the Spartans were denied an equaliser when a Reid header brought out a spectacular save from Mitchell. 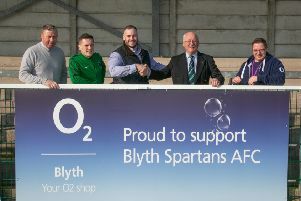 Blyth Spartans, A McHugh, A Cartwright, J Watson, N Buddle, D Morse, D Mullen (N Hooks 57), M Richardson, S Reid, D Maguire, M Wade (W Kneeshaw 78), R Dale. Subs not used: A Nicholson, P Robinson, D Parker.